Chromecast is gaining popularity with Google revealing that it has sold 55 million units since releasing the device in July 2013. 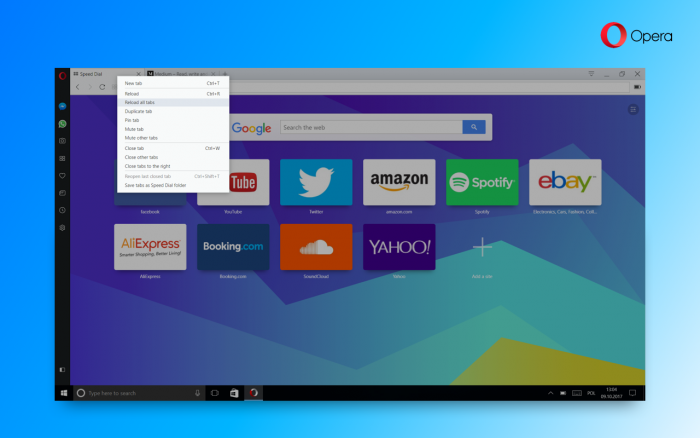 Today, Opera 50 beta supports Chromecast playback. 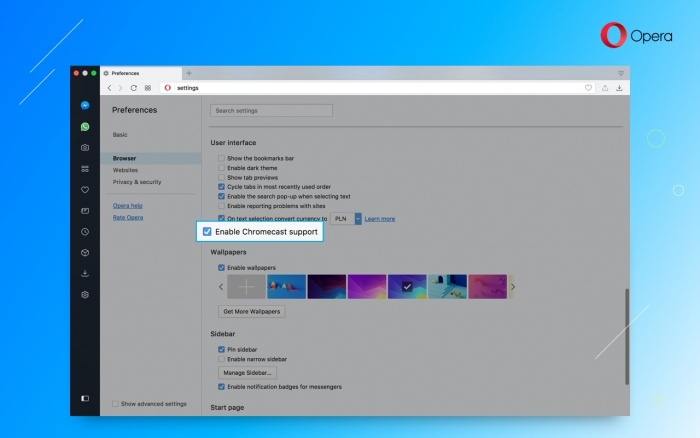 To start casting, first go to Settings (Preferences on macOS) > Browser > User interface and tick “Enable Chromecast support.” Opera 50 can support casting for videos, tabs and your full desktop display. To start casting a YouTube video, for example, click the cast icon found in the video’s player controls, as shown below. Opening the page’s context menu or opening the O-Menu (View on macOS) are alternatives to begin casting. 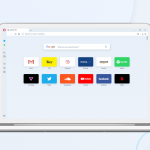 At the moment, Opera’s support for Chromecast is available only in certain markets while we continue to implement this feature on a larger scale. 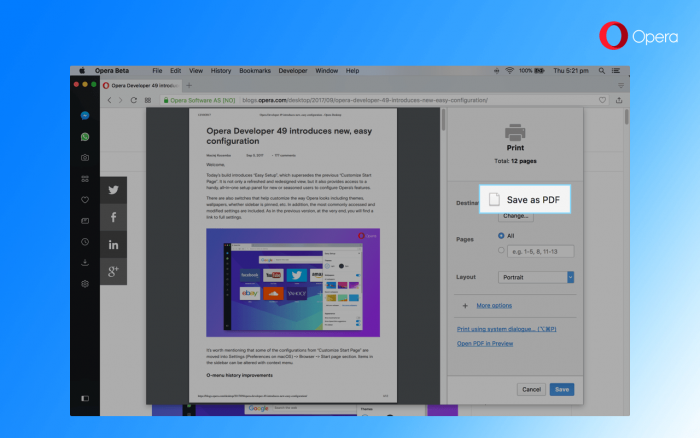 Storing a page for offline reading, sending it to other devices or safe keeping for future reference can now be done with the Save Page as PDF function. To save a page as a PDF file, go to the O-Menu (or File on macOS) and select “Save Page as PDF”. When triggered, it will save the entire web page into a single PDF. A shortcut can be created for this function under Settings (Preferences on macOS) > Browser > Shortcuts > Configure Shortcuts. 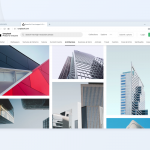 The resulting created file will take advantage of PDF capabilities, which means it will be smaller than a plain screenshot stored in PNG format and you’ll be able to select and copy the text. margins and so on. This is the best option if you later intend to print it. Our new Save Page as PDF option will store exactly what you see on your screen. It’s great for offline reading, sharing pages or keeping them on your system for future reference. The printing method will ask for the page to layout itself in a printer-friendly way. As a result, you may get something different from what you see on screen. You can try both options on this blog post. 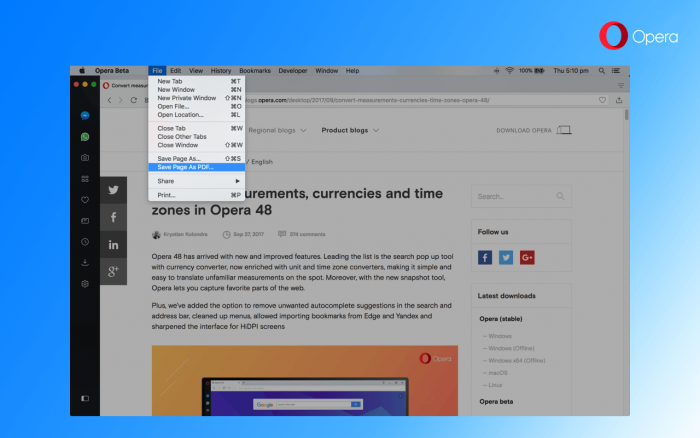 Opera’s Save Page as PDF option will save what your browser sees. 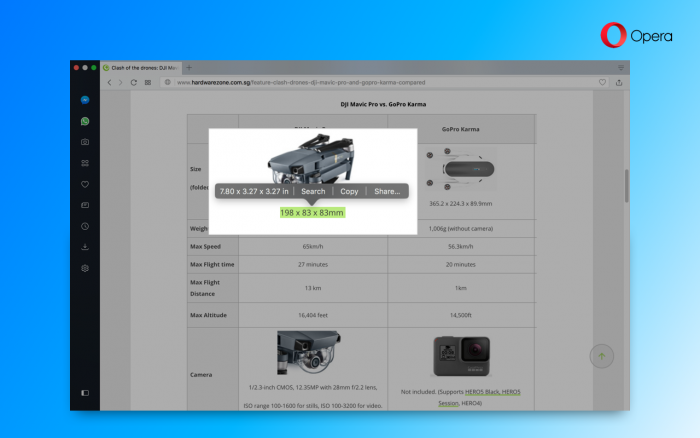 It will not try to load images that are currently invisible, which might be the case for sites that load images only after you have scrolled and made them visible. This option is screen-friendly, which means it’s optimized to save exactly what you see and to be convenient for offline reading. However, it’s not prepared to be printed. In case you want to print the page, you should use the printing method and fine tune the details to your needs. Items in a tab’s context menu were cleaned up and grouped into related sections while receiving new actions. Reopening closed tabs and windows became easier with “Reopen Last Closed Tab” moved to the bottom. The option can change to “Reopen Last Closed Window” (for Windows and Linux platforms) if a full window was the last thing to be closed. “Reload” and “Reload All Tabs” are two new functions to quickly refresh your current browsing session. The latter will ask for your confirmation if you have more than 10 tabs opened. Today, our unit converter is becoming even better as we’ve added support for millimeters [mm] to be converted into inches [in]. In addition, there’s also support for dimensions. This means you’ll be able to convert the dimensions of a 10 x 10″ picture frame or a 10 x 50 x 25 mm collectible toy car. 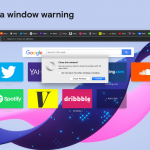 Upon a crash loop detection, Opera will not remove your current browsing session. Instead, all pages will be marked for manual reload upon re-activation, except for the current tab which will detail the encountered problem. This will fix the annoying issue of losing all opened tabs due to an unrelated problem such as with syncing, for instance. [Win] rusradio.ua, hitfm.ua players didn’t play music. [Win, HiDPI] Title bar didn’t look good in dark mode. [Linux] Opera didn’t start on Debian if package chromium-widevine was installed. [Mac] Cmd + Shift + M didn’t hide communicator window. [Mac, High Sierra] High CPU usage of browser process. [Mac, High Sierra] Fix for Netflix’s error message “Whoops, something went wrong…” . [Mac touchbar] Mask-icons didn’t work.